When Peter Ruggiero meets with people in coastal communities to discuss climate change, he asks them to consider what they like most about where they live. And then he asks them to imagine the future. “We get people to think about the positive aspects of the coast, what they like about working and playing along the coast,” says Ruggiero, a geomorphologist (a scientist who studies land forms) at Oregon State University. “And then, in light of problems like sea-level rise and other climate hazards, we start thinking about strategies that can get them to their ideal,” how the community might maintain its cherished values. Signs associated with a changing climate are starting to appear along the West Coast. Salmon struggle in warming waters. The ocean is becoming more acidic. Fisheries have been closed by prolonged algal blooms, aka “red tides.” Rising seas and winter storms increase flooding and erosion. The science may be complex, but the consequences are straightforward: If we continue to emit greenhouse gases into the atmosphere, these problems are likely to worsen. However, this isn’t just a doom-and-gloom story. Scientists are making strides in understanding the climate system and working with communities to use that knowledge to respond and adapt. A snowmobile traverses the slick white surface of a vast glacial ice sheet. In the distance, snow-covered peaks rise to a nearly pristine firmament of crisp blue under a sun that never sets. A team of scientists unloads gear at a makeshift camp and starts the arduous task of drilling slowly into the ice. The lead researcher is Ed Brook. The location is Taylor Glacier in Antarctica. The Oregon State geoscientist specializes in the climate of the distant past and is enamored with very old ice. For him, the key to understanding our future lies preserved in what the ice contains: bubbles of ancient air. Carbon dioxide found in old ice reveals a simple pattern: CO2 concentrations in the air go up during warm periods and down during cold ones. Brook’s research has revealed a serpentine-like exchange of carbon between the atmosphere, ocean and land. Air in old ice reveals that in the past 800,000 years, CO2 hasn’t risen above 300 parts per million. Often, as during one of Earth’s many ice ages, it’s been much lower. Current levels are about 400 parts per million and rising. This carbon traps heat and is expected to lead to higher temperatures. The past may not be a prologue to our future, but work by Brook and other paleoclimatologists tells us a great deal about the climate system and how it occasionally “tips” from one regime to the next. In a paper published last year in the journal Nature, Brook and several OSU colleagues documented 18 such “abrupt” climate changes over the past 68,000 years. Like Brook, Alan Mix has traveled to far-off places to extract cores, but he is devoted to a different material: sediment from the seafloor. In addition, the Oregon State geochemist loves old cartoons, specifically Wile E. Coyote. The ever-optimistic cartoon character is infamous for pursuing — but never capturing — a certain speedy roadrunner. His predatory pursuits frequently send the carnivore over a cliff where he remains suspended in midair until, noticing his predicament, he promptly plunges to the canyon floor. This, says Mix, is what a climate tipping point looks like. Tipping points happen when the climate moves from one state of equilibrium to another, as it did when the Earth emerged from the last ice age. These changes, says Mix, often happen quickly, geologically speaking, and tipping points may occur before outward signs are noticeable. In a study published last year in the journal Science, Mix and his former graduate student Summer Praetorius demonstrated what might have triggered a tipping point corresponding to the abrupt end of the last ice age. Using radiocarbon dating of fossilized microorganisms found in ocean sediment cores, the researchers demonstrated that the warming of the North Atlantic and North Pacific oceans some 15,500 to 11,000 years ago occurred in a coordinated, synchronized fashion. As a result, they say, the global climate tipped over an edge. Ice melted and sea levels rose. Both are occurring today as well. It’s the year 2100. Unchecked carbon emissions have led to a world that’s considerably warmer than it was just a century earlier. Policymakers in 2016 had set their sights on this year when thinking about the future. However, there isn’t anything magical about the date. Climate change isn’t stopping. Carbon in the atmosphere continues to heat things up, and sea levels are still rising. “One thing that the (paleoclimate) record does inform us about, as far as global warming, is an idea of what we call sensitivity — how sensitive sea level is to a given amount of warming,” says Peter Clark, a paleoclimatologist who holds the title of distinguished professor at Oregon State. Clark was one of two coordinating authors on a comprehensive analysis of sea-level rise and climate change for the Intergovernmental Panel on Climate Change, the world’s leading climate research organization. Last winter, he made headlines with an article in Nature Climate Change. Using climate models for the next 10,000 years, he and his co-authors, including Mix, outlined a sobering message: Even if humanity meets its goals of lowering carbon emissions, a substantial amount of atmospheric carbon that was already released will hang around, some of it for tens to hundreds of thousands of years. The loitering carbon will continue to trap solar radiation, warming the planet and leading to melting glaciers and ice sheets and to rising sea levels. Clark offers the analogy of boiling a pot of water on the stove. Turning on the burner applies heat to the water, but the water doesn’t warm right away. It takes time. In a similar fashion, greenhouse gases are warming the atmosphere. The question is how long it will take the oceans to rise and by how much, as air and water temperatures increase. Melting glaciers and ice sheets and warming ocean waters (water expands as it heats up) all contribute to sea-level rise, but each unfolds at a different pace: glaciers over tens of years; warming water over hundreds to thousands of years; and ice sheets over several thousands of years. All lead to a long period of sustained and accelerating coastal flooding. Warming oceans don’t just affect rising sea levels. Collectively since 1970, our planet’s oceans have absorbed roughly 90 percent of the extra heat produced by human-caused warming. This, however, is a global aggregate. Tying regional warming events to climate change can be trickier. Skipjack tuna, normally found in the balmy waters of the tropics, are reeled in by fishermen off the southeast coast of Alaska. Ocean sunfish and a thresher shark — more outsiders — are also hooked. Meanwhile, seabirds on the Pacific Northwest coast, normally chunky Cassin auklets, arrive en masse and emaciated. Starting in late 2013, an expanse of exceptionally warm water more than twice the size of Texas and approximately 300 feet deep appeared off the West Coast, stretching from Oregon to Alaska. The “Blob,” as it came to be known, is believed to be the culprit behind a series of peculiar occurrences, including the reeling in of tropical fish off Alaska. “However you slice it, the ‘Blob’ is extremely unusual,” says Oregon State professor Philip Mote, director of the Oregon Climate Change Research Institute. The underlying meteorological cause, he adds, is believed to be a prominent ridge of higher-than-normal pressure that effectively parked itself off the West Coast, keeping the winds modest and the skies clear and giving the ocean ample time to soak up the sun. This ridge has been implicated in the historic drought in the West over the past few years. But while the drought is widely believed to have climate change’s fingerprints all over it, says Mote, the connection between the “Blob” and climate isn’t so clear. To study that relationship, Mote and his colleagues are doing what most climatologists do: They’re running a series of computer models. Essentially colossal video game simulations of the Earth, these models tend to be bulky — “computationally expensive” — and, therefore, require powerful super computers to run them, or, as Mote and his colleagues would learn, a lot of average computers. The effect of the “Blob” on sea life comes as a kind of proof of concept of an idea that fisheries biologists have been concerned about for decades: Warming oceans are expected to impact many species of fish, including salmon. A recent analysis of juvenile Chinook salmon in the Pacific shows a strong relationship between warmer waters and salmon health. The study’s results, published in the journal PLOS ONE, take issue with a long-held assumption: Juvenile fish will eat less in warmer waters. The researchers found the opposite. This is counterintuitive, admits Daly and her co-author, Richard Brodeur of NOAA’s Northwest Fisheries Science Center. Basically, the extra food isn’t doing the fish much good. In warmer temperatures, the metabolism of the fish ramps up, forcing them to consume more calories. This amounts to a metabolic tax on the animals. And because food is scarce in warmer waters, the fish have to burn more calories to get more calories. That amounts to another tax. Normally prominent at low tide, the beach is nowhere to be seen. There’s only the ocean and the wave, which builds slowly at first and then comes crashing in, whacking the side of the small, three-story seaside hotel, missing by mere inches the white plastic chairs on the first floor balcony. Now it’s a clean run up Hawk Creek to the Salem Avenue bridge, which the wave quickly overwhelms with a tempestuous gush of white water. For the town’s residents, the bridge is the only access to the highway and to safety. This incident of flooding was caught on video in the coastal community of Neskowin during a recent winter, but it could also be a glimpse into the town’s future. Storms erode shorelines and pose a risk to homes. (Photo: Oregon Sea Grant). Since the mid-1960s, Neskowin has been losing roughly two meters (6.5 feet) of its beach a year to the Pacific Ocean, making the town of about 400 one of several erosion “hot spots” along the West Coast. 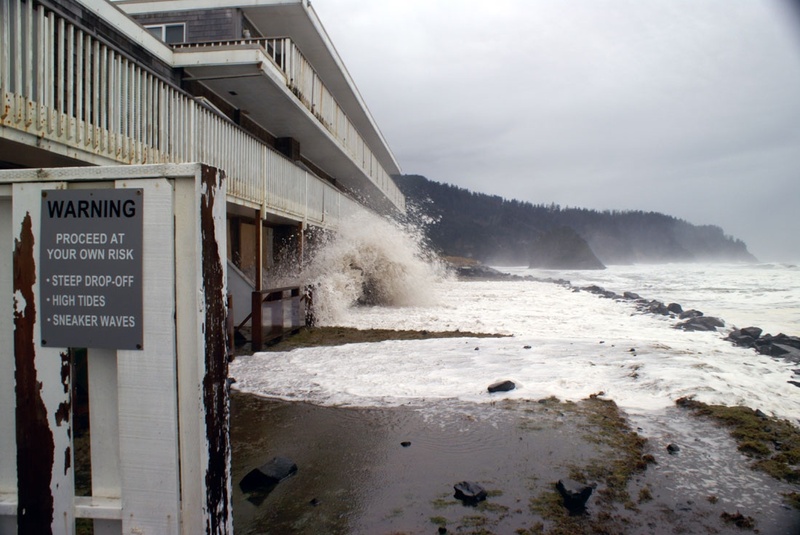 Neskowin’s loss has been pinned on large El Niños and on increasing wave heights, both of which — and there’s disagreement among scientists here — might or might not be connected to climate change. But for the residents of Neskowin, placing blame isn’t as important as better planning. To ward off the Pacific’s incoming assault, community members armored their homes, placing rock barriers called riprap between their beachfront houses and the waves. But they soon realized these walls weren’t going to be enough. Many were concerned about rising sea levels. To learn more, they reached out in 2009 to the scientific community, starting with Oregon Sea Grant and Peter Ruggiero. Property owners and local officials formed the Neskowin Coastal Hazards Committee, which was coordinated by Sea Grant specialist Patrick Corcoran (See “Facing Cascadia“). They consulted with Ruggiero and other scientists who presented the latest findings about wave heights, sea levels, erosion and other threats to coastal properties. After wrestling with the science and accounting for the needs and values of the community, the committee produced a 300-page adaptation plan, which describes Neskowin’s ocean-related vulnerabilities and techniques for addressing them. In 2015, after review and revision by Tillamook County, the state Land Use Board of Appeals upheld the Neskowin plan. The guidelines were set by the science, but community members identified what factors — sea-level rise, population growth, housing, beach access — mattered most to them. In his research, Ruggiero has tracked wave heights and beach erosion, which got him thinking seriously about what the West Coast might look like as climate changes. He realized that those planning for the future would need to account for many uncertainties. Working with Oregon State bioengineering professor John Bolte and a computer model known as Envision, Ruggiero and teams of students have created multiple scenarios — including lessons learned in Neskowin — for exploring alternative futures in Tillamook County (See “Difficult Choices“). The researchers are conducting a similar project in Grays Harbor, Washington. It’s impossible, Ruggiero says, to know how much sea-level rise to expect by the end of the century. Projections range from a few inches to several feet. It all depends on how much CO2 and other greenhouse gases will be emitted in the future. Seawalls may work for a while, but as Peter Clark’s work suggests, they are not a long-term solution in the face of continuous sea-level rise. That’s why the question of climate tipping points is so important. Oregon State research around the world — in Antarctica, Greenland and the deep oceans as well as the Pacific Northwest — will help determine if and when such a point is reached. It is already helping Oregonians on the coast and elsewhere make decisions about the world they leave for future generations.